Jose Aldo is a Brazilian Mixed Martial Arts (MMA) featherweight fighter. 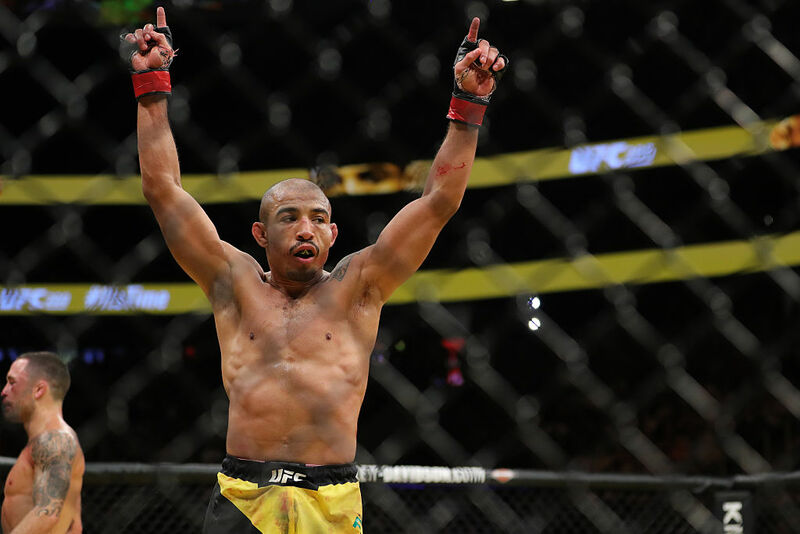 He was unbeaten for 10 years from 2005 until he was defeated by Connor McGregor in 2015.
Who is Jose Aldo, how old is he, when is his birthday, how tall is he, where is he from and what is his background? Jose Aldo da Silva Oliveira Junior is a featherweight Mixed Martial Arts (MMA) fighter from Manaus in Brazil. He was born on September 9, 1986 and is 31 years old. He is 1.7 metres tall. He grew up in a very poor but supportive family. As a child he wanted to become a professional footballer but in an effort to stop getting hurt in fights with other children he learned capoeira. He attracted the attention of a jiu-jitsu trainer who invited Aldo to train with him. At the age of 17, Aldo moved from Manaus to Rio de Janeiro to train to be a professional fighter. It is rumoured he was so poor at this time other fighters would check he had eaten before starting training each day. Why is Jose Aldo famous and what is his occupation? He is a UFC featherweight fighter and has previously fought Connor McGregor and Max Holloway. He famously went 10 years undefeated, with five years spent as UFC Featherweight champion. What is Jose Aldo’s net worth? Celebritynetworth.com has estimated Jose Aldo to be worth $9million. How much does Jose Aldo earn? The Sun estimated that between 2011 and 2014 Jose Aldo was earning around £400,000 a year, but by 2015 this increased to around £1.1million. For UFC 218, Aldo’s rematch against Holloway, he was paid $500,000 including his share of the pay-per-view fees. 5 years as UFC champion. How much does Jose Aldo weigh? As a featherweight Jose Aldo weighs in at 145 lbs or 66 kg. Who will Jose Aldo fight next in the UFC, how much does he make per fight, who has he fought, how many fights has he won, what are his most famous fights, has he fought again since Conor McGregor, how many times has he fought McGregor? Jose Aldo has had 30 fights and won all but four. He has only faced Connor McGregor once, at UFC 194 at the MGM Grand, Las Vegas, in December 2015. Aldo initially fought for World Extreme Cage Fighting (WEC) and boasted an unbeaten record of 8 wins and no losses. When the WEC merged with UFC in 2010 Aldo was declared as the inaugural UFC featherweight champion. He successfully defended this title seven times, including winning Fight of the Night three times, before he met Connor McGregor in Las Vegas in December 2015. McGregor knocked Aldo out 13 seconds into the first round and this was Aldo’s first defeat in ten years. 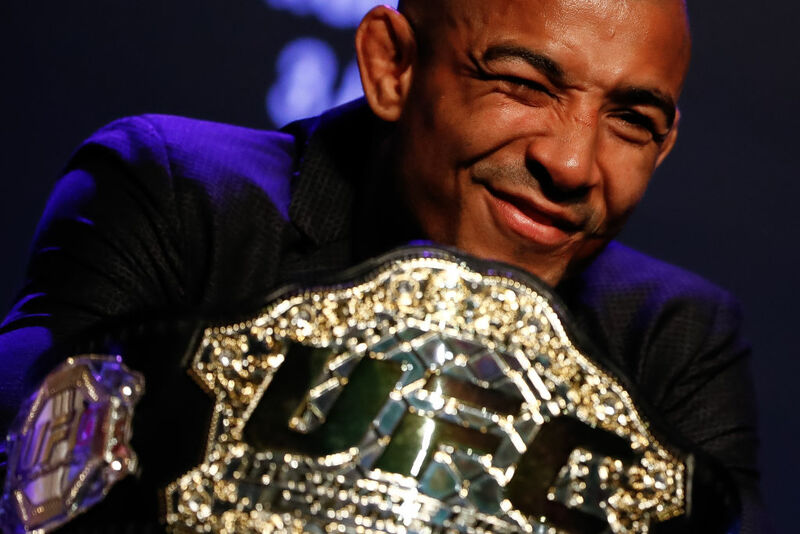 In 2016, Aldo regained the UFC featherweight title when he beat Franke Edgar on points. He then went on to face Max Holloway in June 2017 but suffered a technical knock out (TKO) in the third round. In December 2017 he fought Holloway again in an attempt to regain his UFC featherweight title, but the referee once again called the fight in the third round via TKO. What happened to Jose Aldo’s face, how did he get his scar? When Aldo was a child his older sister dropped him on a barbecue, leaving him with a scar on the left-hand side of his face. Aldo claims this was not the only injury he sustained as a child at the hands of his siblings, but he does not hold grudges insisting his sisters were just ‘little kids’ at the time. He has not yet announced his retirement. He lost his most recent fight to Max Holloway on Saturday 2 December 2017. This was his third loss in four fights which sparked rumours he may announce his retirement soon in the near future. Does Jose Aldo have any children? Jose Aldo and his wife Vivianne have a daughter Joanne. She was born in 2012. Is Jose Aldo married, who has he dated in the past, was he married? Aldo married Vivianne Pereira in 2005. His wife has a purple belt in jiu-jitsu and has fought professionally. When Aldo was in Dublin doing promotional work for his bout with Connor McGregor, a major Irish tabloid newspaper, The Sunday World, alleged that Aldo had cheated on his wife with Brazilian model Heloaney Guimares.